Alright, I’ve left you in suspense long enough. The reasoning behind the delay is due to IKEA’s shotty inventory predictability for the wicker sectional we wanted. Don’t get me wrong, I love me some IKEA but when you have to leave work, drive 30 minutes to the store, borrowing your father’s truck- you really should be able to purchase online and have a guaranteed pick up in store. But that’s not how my big blue friend rolls. They have this “inventory predictor” that has no rhyme or reason to it from the consumer’s point of view. One day there’s nine in stock, the next day two, the next day none until three come in on Thursday, oy vey! It’s amazing what a coat of paint will do! Or a couple coats, really. Definitely took some priming but after that, basic white did the trick. We peeled up all the faux wood parquet tiles and painted the floor the same Benjamin Moore Rockport Grey as our master bedroom floor. The curtains were a small stroke of genius if I do say so myself. 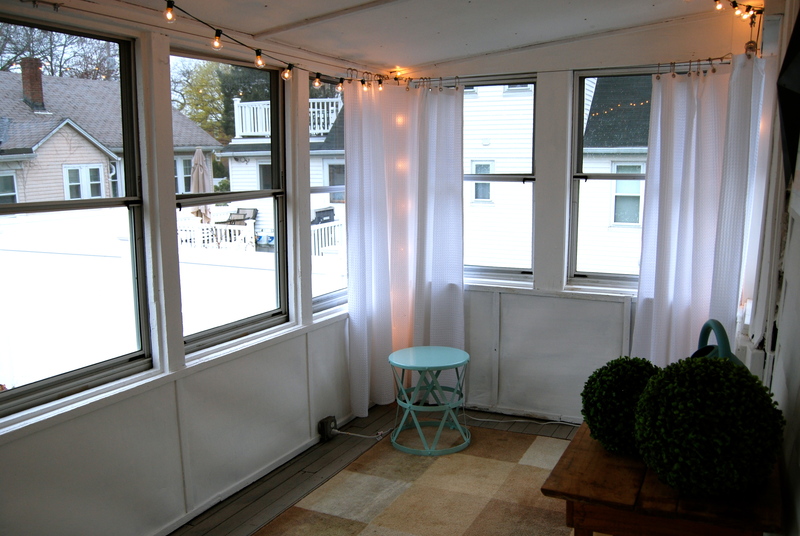 Knowing that a rod was next to impossible since the curtains butted up to the ceiling and anything structural would look ridiculous in a sloping sun porch, we decided to clip shower curtain rings onto metal rope tightened with a turn buckle. 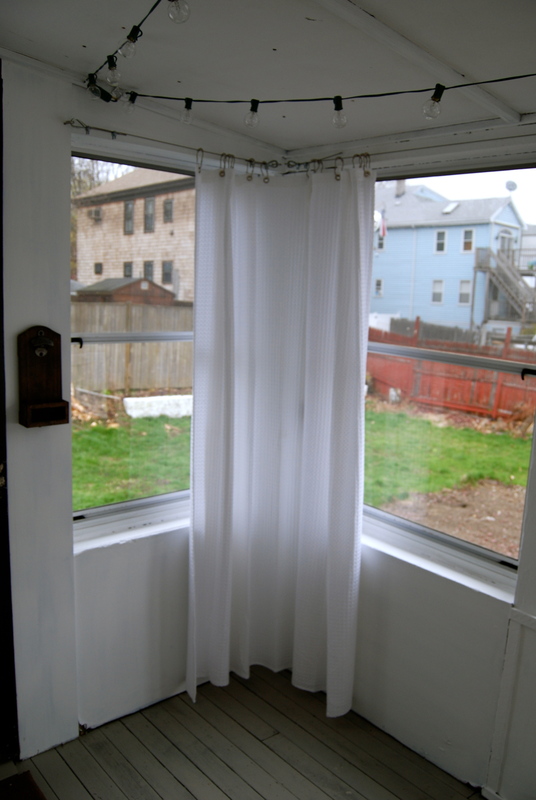 The shower curtains soften the corners of the room, add a little privacy, and are already moisture resistant in case we leave the screens open in a rain storm. 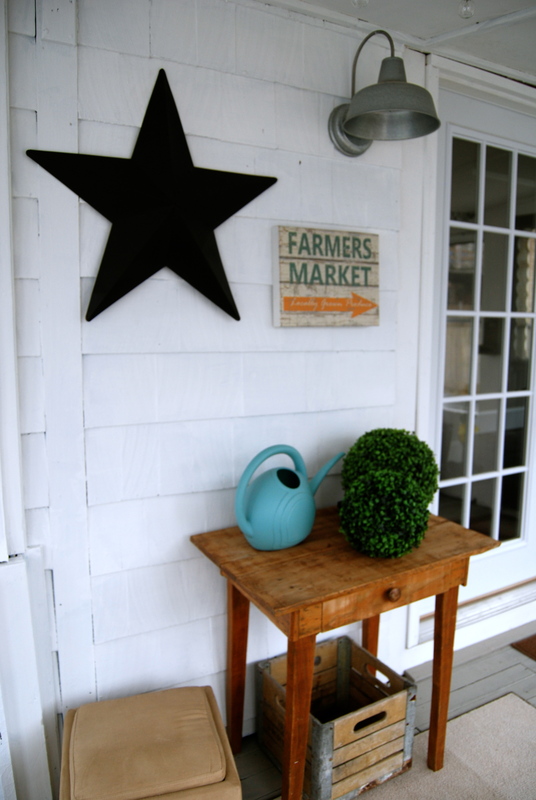 But it’s the accessories that make this porch so inviting. I’ll even tell you where we got everything! 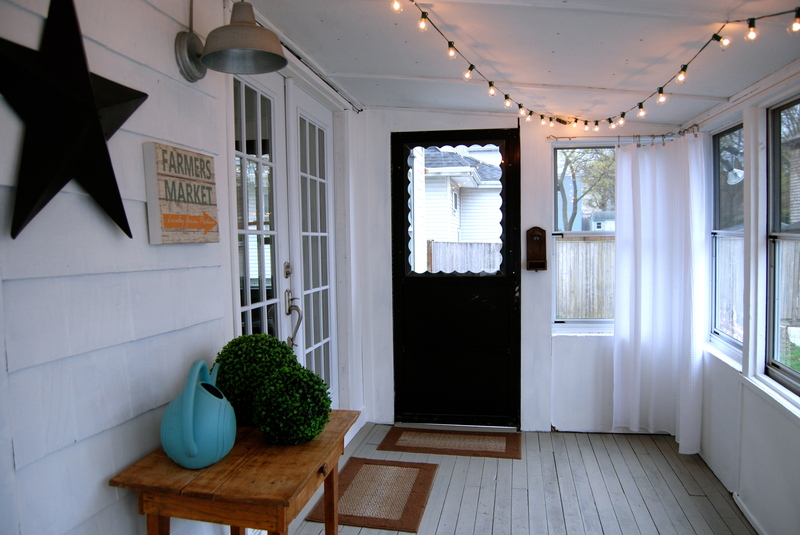 Galvanized Outdoor Light from Lowes. 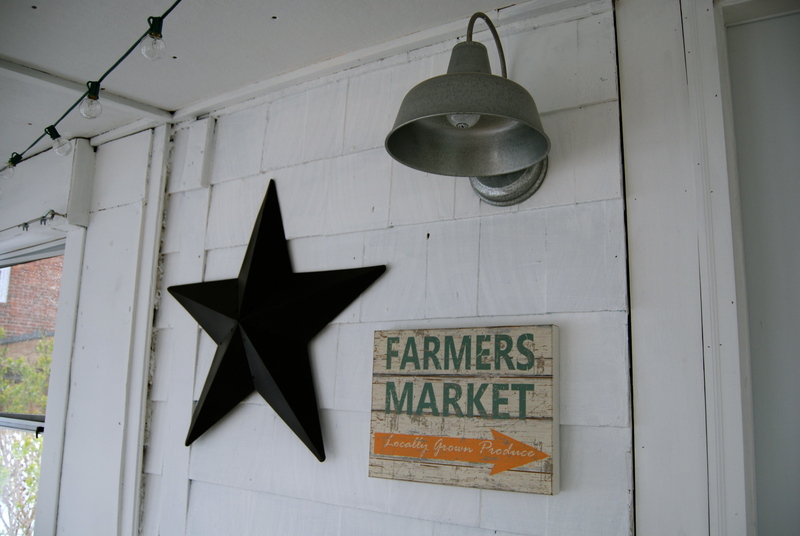 Farmer’s Market Sign and Barn Star from Homegoods. Wooden Table came from a friend and Hood Bin was antique find from my Mum. Watering Can from Target. 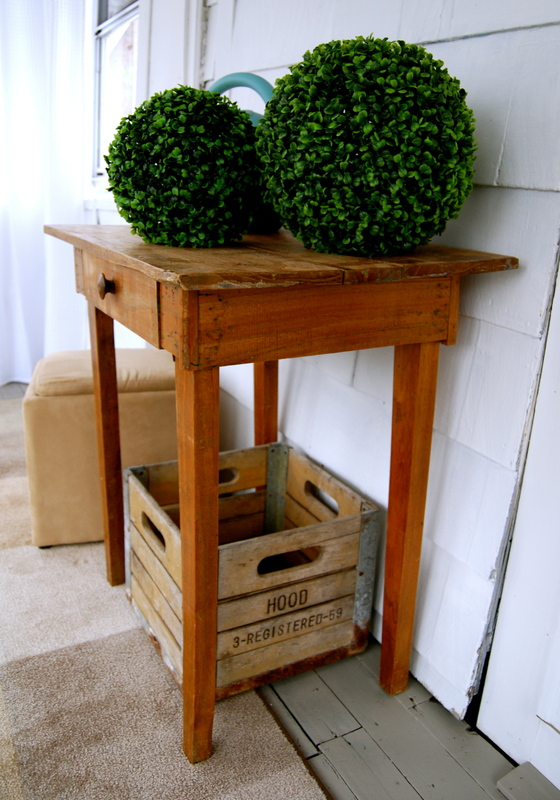 Boxwood Spheres from Homegoods. The big sphere has tiny twinkle lights in it! 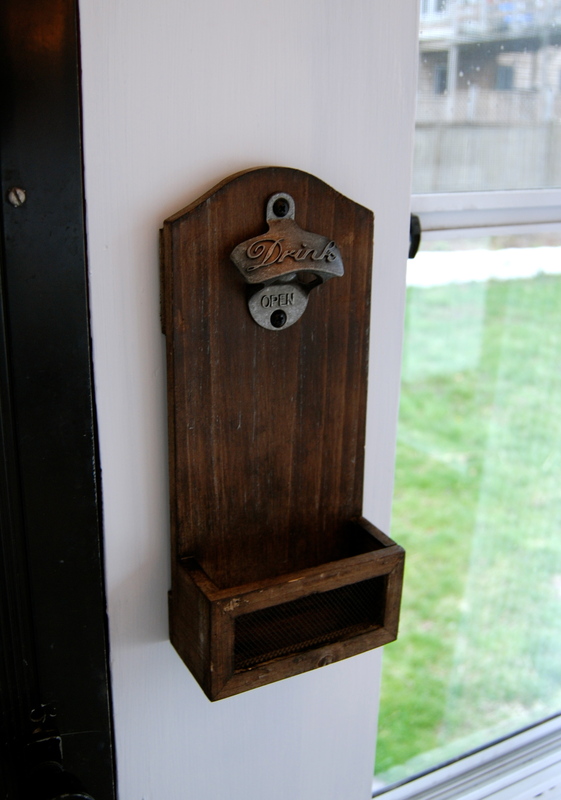 Vintage Mounted Bottle Opener from Target. Glass Globe String Lights from Target. 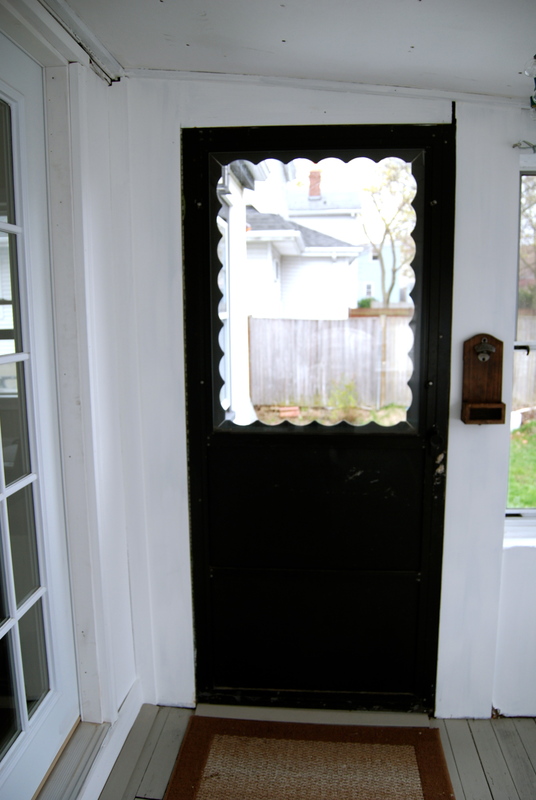 I absolutely loved opening both French doors on Easter and letting the party spill out onto the porch. It would have been even nicer with seating but what can you do! We’ll keep searching for alternatives and keep IKEA in our big blue back pocket. I’m so pleased with how it turned out. It doesn’t look out of place at all. The cabinet and butcher block go with the rest of our kitchen and the wicker chair and baskets on the open shelves look right at home in a kitchen. The shelves are perfect! 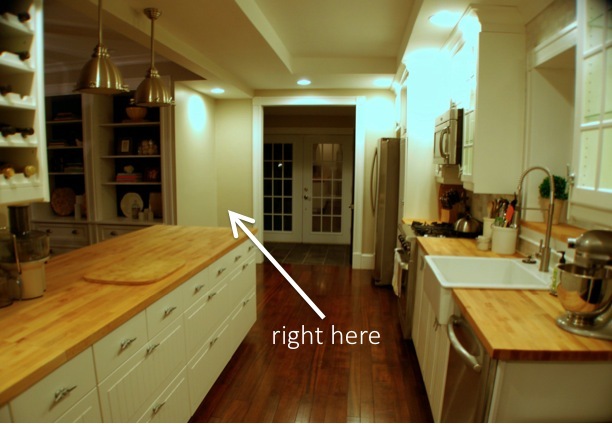 They fill the space nicely with the perfect balance of function and flair. The print of our house was a Christmas present from my brother and sister-in-law and it’s one of the best gifts we’ve ever received. What could be more appropriate after a year spent focusing all our time and energy on this place? It’s beautiful and I’m so glad it’s in a place of honor. The middle frame contains a page from the book Eat, Pray, Love that spoke to me and the smallest frame a print from Etsy. The metal anchor was inherited from our home’s previous owner. If you remember, I gave them a little makeover here. The small “antique” camera is actually a pencil sharpener but seems fitting in the space I’ll edit my photography for this blog. And finally the baskets from IKEA house all my camera equipment. All of the accessories I had. 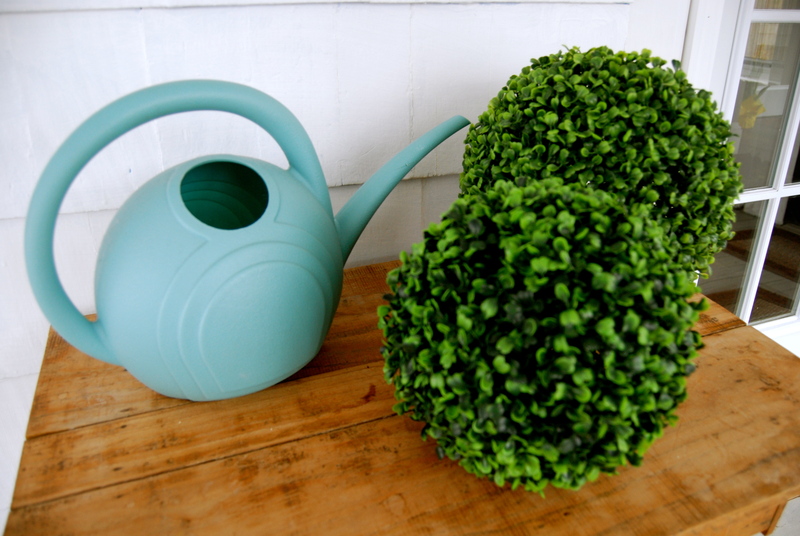 This cute topiary, a flower pot for markers, an old silver vase for pencils. The chalkboard clipboard is perfect for notes, holding recipes to try, or inspirational pics from magazines. A couple of drawer organizers from HomeGoods helped corral office supplies and keys in the top drawer. The bottom drawer has plenty of space for magazines, catalogs, and my design inspiration clipboard. Now I’m never one to discuss money in public. Frankly, I find it incredibly rude. However, I know a lot of bloggers break down projects in terms of cost and I have been asked by several readers about our budget for certain rooms so I thought that for this project, I’d share. 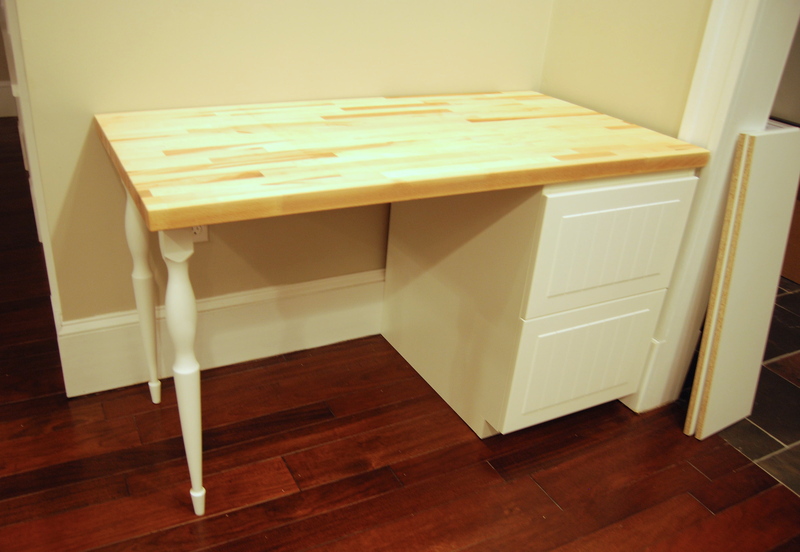 I wanted to complete this desk area for $500 and am happy to say, I went over by a mear $14. The bulk of the budget was spent at IKEA where we purchased the cabinet, counter top, two table legs, the two shelves, and the two baskets. I typically shop around but in this case, since I wanted to match our kitchen cabinets and countertops exactly, IKEA was the only option. 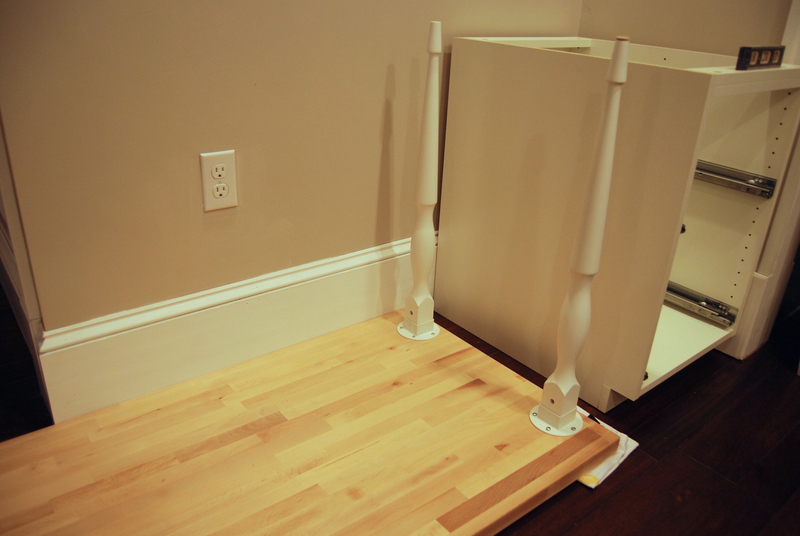 The shelves and table legs were a fantastic deal there so those came home with us that day too. I got the wicker dining chair at Pier One using a 20% off coupon. Most of the accessories and office supplies I already had and the lamp is from Target years ago. But I did spend about $20 on the drawer organizers, some new Sharpies and pencils, and the clipboard. This command center adds so much to our home. I’m able to edit and organize my photos so much easier with everything right there and writing blog posts at a desk is so much more comfortable than perching my laptop somewhere throughout the house. I also think it will become so essential as our family grows and I can keep track of kids schedules and family paperwork as it inevitably comes into the house. Happy to command our home (with my hubs) from this kitchen command center! The plan was to bang this project out this week. Husband’s don’t like that when you say, “uh, yes we’re assembling this tonight.” But the man must love me because we spent the evening attaching the IKEA cabinet to the butcher block, adding a couple of legs, and hanging two shelves. 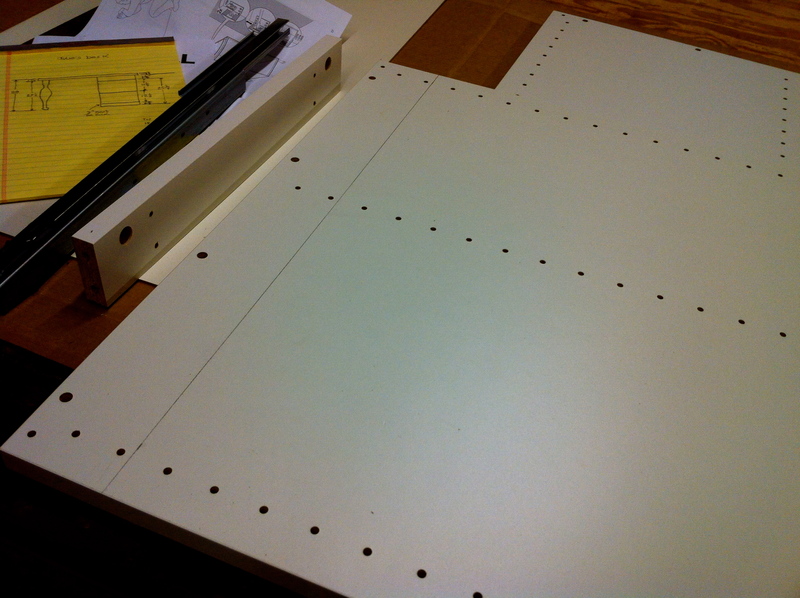 First things first- Dad brought over the cabinet he modified to sit perfectly at desk height. It was fabulous. The legs went on easily when we flipped the butcher block upside down. We got these legs at IKEA too by the way. I thought it would be too much to close in the space with a cabinet on either side. 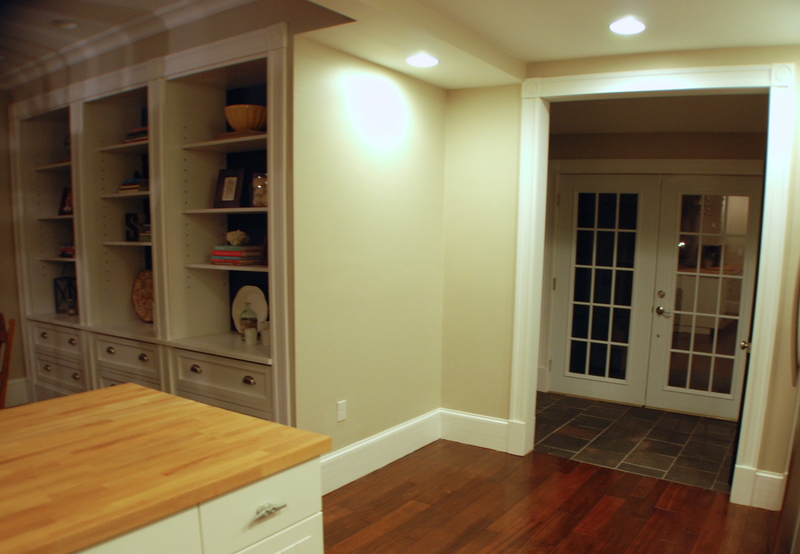 The legs give an airier feel to the passage between the kitchen and dining room. The two drawers slid nicely into place. 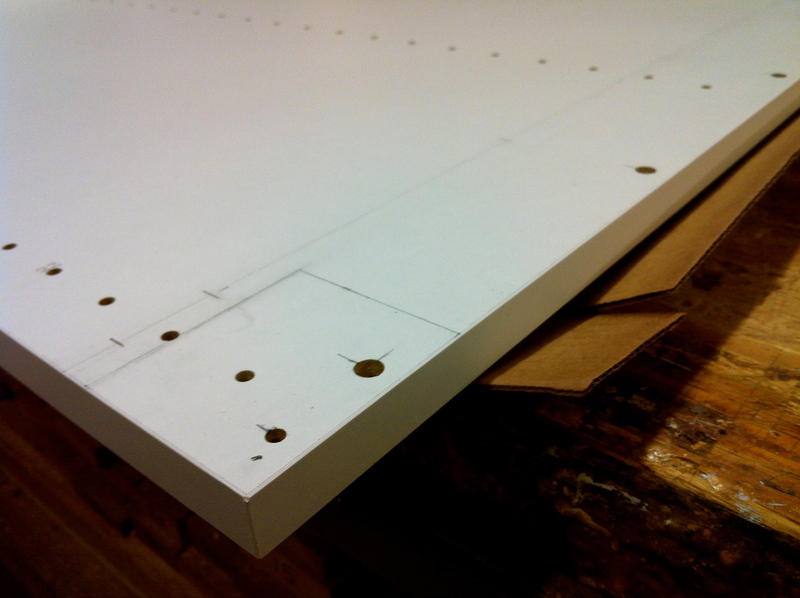 Gotta love that soft close hardware from IKEA! I knew I wanted open shelves above the desk but I have to admit, even I was overwhelmed by IKEA’s selection. They really do have everything from steel minimal brackets to ornate rod iron brackets and everything in between. Jared pointed out these wooden black brackets that I love. They add a touch of country to the modern white shelf and they look fantastic by the black half bath door across from it. With a gorgeous wicker chair from Pier One, my Kitchen Command Center was almost complete! Stay tuned! Did you guess my new project from my teaser yesterday? I’ve talked about it before and with a strict $500 budget, I set out to create my Kitchen Command Center. And what I don’t have is a place for my laptop or camera equipment or general paperwork and office supplies. Sure Jared has an office upstairs but that’s his office and since he works from home, it really needs to act as a professional space just for him. So off to IKEA we went to get just one more cabinet and one more piece of butcher block countertop. 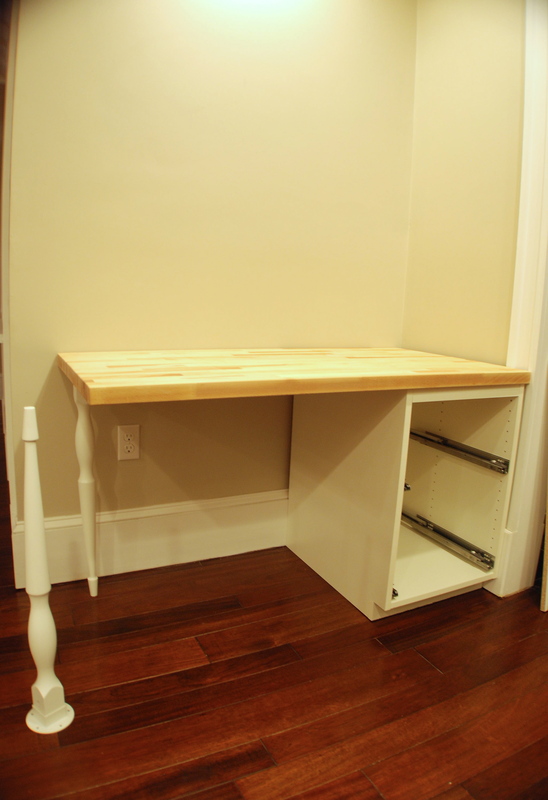 With a matching cabinet and top, the “desk” would fit perfectly in our kitchen. 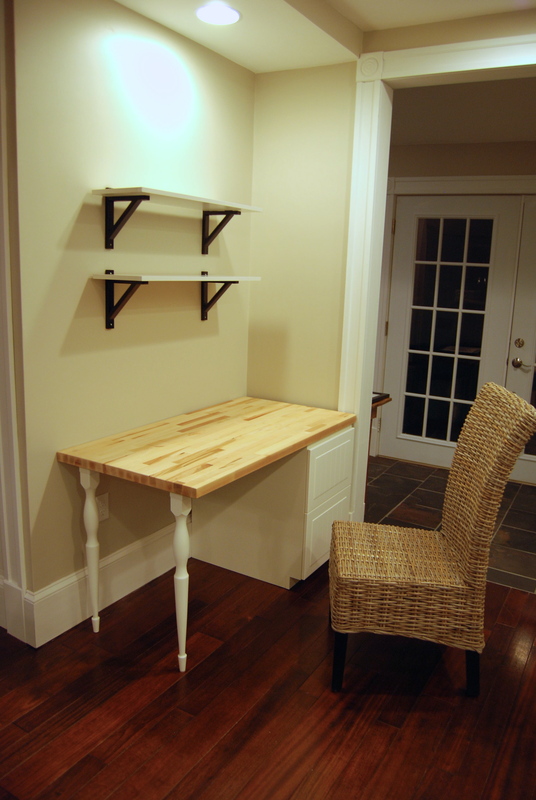 But the trick is that the desk obviously needs to be lower than countertop height. Enter my Dad with his custom cabinetry abilities. 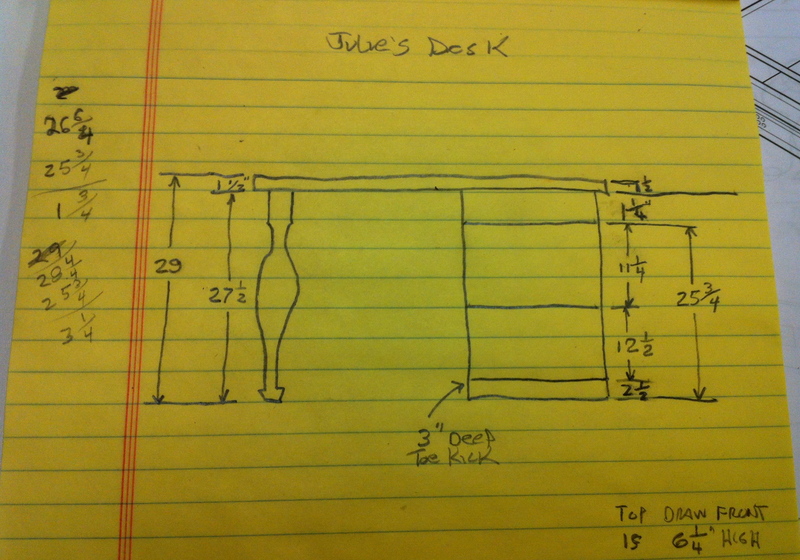 He drew up a little sketch and determined we’d need to cut just a couple inches off the top of the cabinet and a couple inches off the bottom to form a small toe kick and voilà! 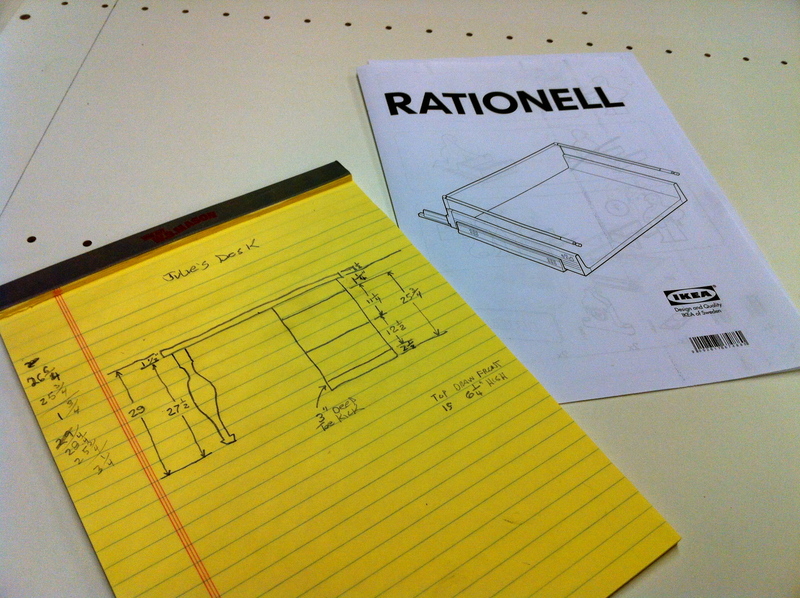 The three drawer base cabinet would turn into a perfect two drawer desk base.